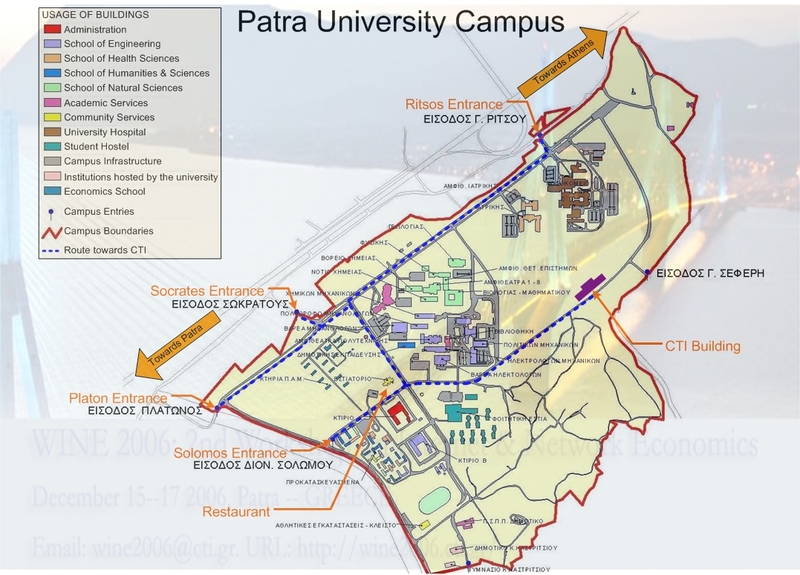 Patra is reachable by plane (via Athens) or by ferryboat from Italy. The closest convenient airport is Athen’s Eleftherios Venizelos International Airport. [BY CAR] Several car rental agencies operate on the airport. The new “Attiki Odos” high-speed toll motorway connects the airport with Athens and the main greek highways. Leave the airport following initially the signs to ATHINA and then to ELEFSINA to enter “Attiki Odos”. From that point on just stay on the highway following the signs to ELEFSINA, subsequenty to KORINTHOS, and finally to PATRA. After Korinthos, the highway splits into two and you must follow the right way (there are signs to PATRA). On this second half of the trip you must be a bit more careful, as the highway gets narrower - one lane plus the emergency one. It is typical to drive on the emergency lane so that other cars (moving faster) can bypass. The total distance between Athens airport and Patras is ~250km and the total cost of the tolls is 7.2 euro. When reaching Patras, take the exit “PATRA-CENTRE / PORT”, and then follow the signs to “PORT”. 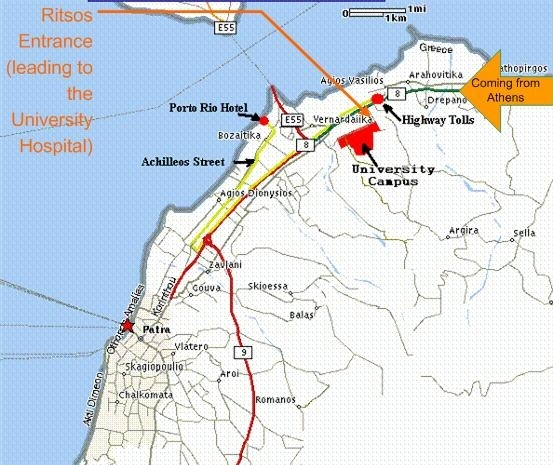 In order to come directly to CTI (coming from Athens), just before Patras, you will pass via the Highway Tolls construction, where you don't pay. The easiest way then to the Campus is to go to a right turn immediately after the toll. Consequently, follow the signs towards the University Hospital. It is in the university campus. The crossroad right in front of the hospital is actually the Ritsos Entrance of the campus. You can locate CTI within the campus here). You can buy tickets for the whole trip at the Proastiakos station in the airport. The small ticket (costs 8 Euros) is for Proastiakos and you have to validate it before entering the train. The large tickect is for the part of the trip from Korinthos to Patras and costs around 9 Euros (1st class, recommended). If you miss the Kifisias station when coming from the airport, do not worry: you can change also at one of he next two stations, “Neratziotissa” or “Iraklio”. Note that Korinthos is the end of Proastiakos and the intercity train to Patra departs in the next platform (no possibility to miss it, since there is no other train to change). [BY BUS] The “KTEL” intercity bus company has regular buses to Patra. You must first get to the “Kifisos KTEL Coach Station”. You can get there from the airport, either by taxi (approx. 40 euro) or by taking the X93/E93 express bus that departs just outside the airport terminal at the Arrival level. The bus stop is next to Arrival Exit 5. The ticket costs 2.90 and you can buy it in the bus or at the bus stop. Either way it takes between 40 and 60 min to get there. From Kifisos Coach Station there is a bus to Patra almost every 30 min. The first bus is at 05:50 and the last at 22:00. Trip time is around 3 hours 10 minutes (or 2 hours 40 minutes for an “express” bus). The ticket costs around 14 euro and you must buy a ticket before boarding. There is a big ticket hall at the east side of the station. Head for the booth with the signs “Achaia” and/or “Patra”. There is no need to reserve tickets in advance, you will usually find a ticket for a bus leaving in the next hour. The detailed timetable is here. Ask at the ticket booth for directions on how to find the proper bus. Several companies with modern ships link Italy with Patra from the ports of Ancona, Bari, Brindisi or Venice. The trip duration from Ancona to Patra is about 19--20hours. You will find detailed timetables here. Site maintenance: Spyros Kontogiannis. Last update: 13/12/2006.